This is an E.F. & F.H. 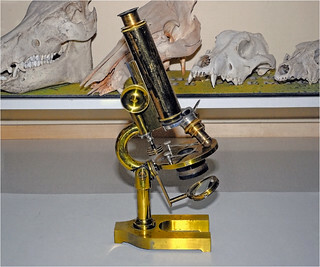 Tighe microscope (ca 1889), after being reassembled following the work done to rectify the jammed coarse focusing assembly. What looks like an ugly black coating on the tube is actually the reflection of the unlit back wall of my computer room behind me. 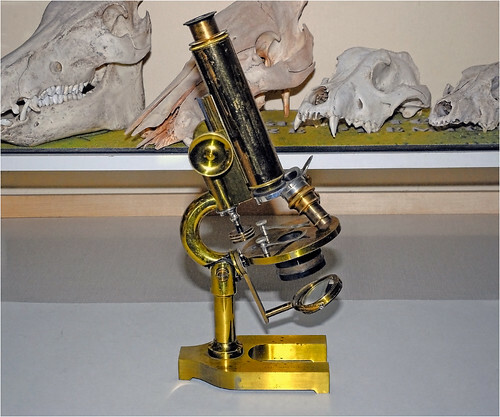 Here the scope is inclined slightly but will be returned to an upright position for returning to its wooden box. The objectives must be swung out to either side and brought nearly into contact with the stage plate to allow fitting into the box.